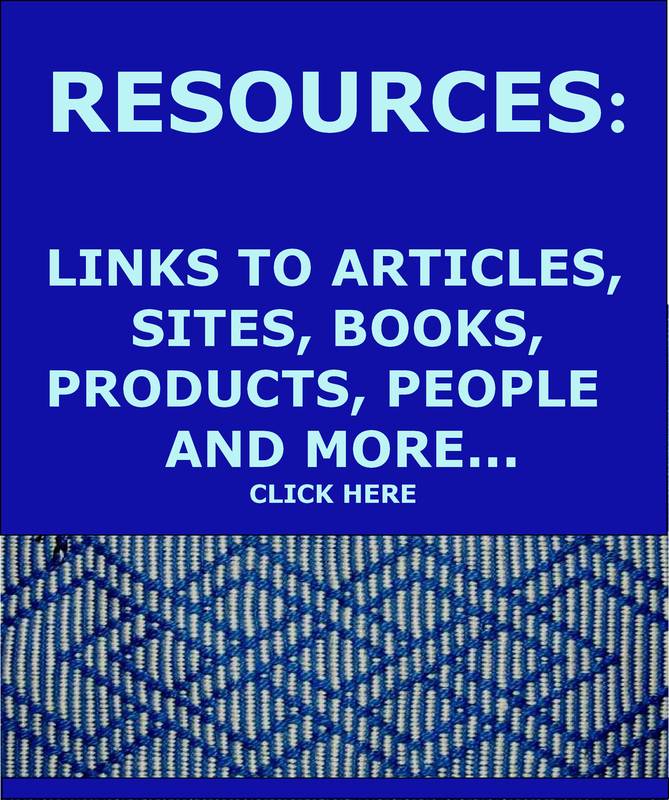 Backstrap Weaving – My New E-book of Patterns! My new e-book of pattern charts, Complementary-warp Pattern Book, is now available from patternfish.com! This is what has kept me really busy and excited for many months. When I missed out on my trip to Bali last year, I had time on my hands to get down and weave and weave and weave and add to the big basketful of sample bands I had started for this book. Then came the long process of creating the charts and laying out the book…not quite as much fun. I hope you will enjoy the result! It’s a book of patterns…one hundred of them!…for beautiful double-faced bands and other larger projects that can be woven using the complementary-warp pick-up technique that I teach in my earlier books. This collection of motifs consists of pebbly-type patterns, the ones that I like to call Andean Pebble Weave. Weaving pebble patterns using two sets of heddles is just one option. 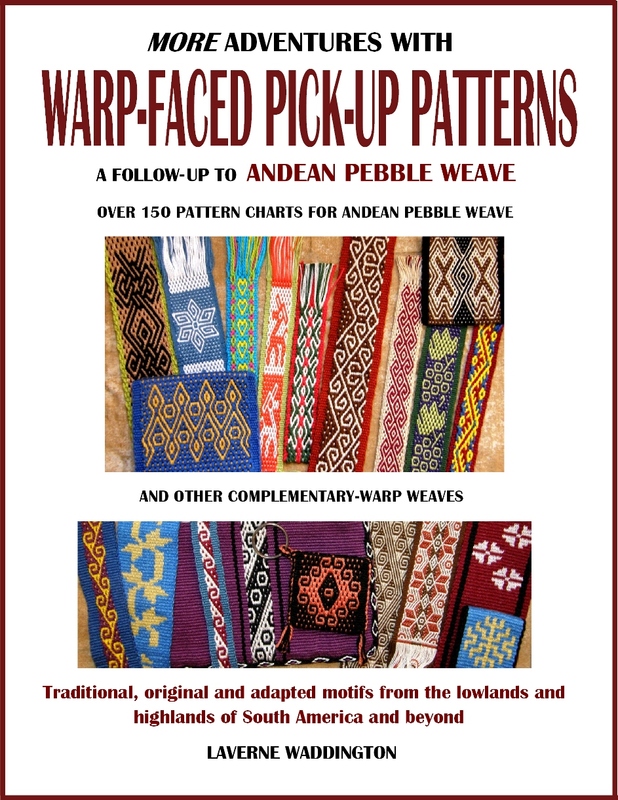 If you learned the “two-heddle method” in my first book, Andean Pebble Weave or the “picking cross method” in my second and third books, More Adventures with Warp-faced Pick-up Patterns and Complementary-warp Pick-up, you will be able to weave all the patterns in this new book of charts! Using a temporary picking cross is another option for creating pick-up patterns. I am proud to say that many of the motifs in this book have been created by my students and weaving friends around the world who have either taken my classes or used my books. I am constantly astounded by what their imaginations have produced and grateful that they have all been more than willing to allow me to include their designs in this book for your own personal use. Inspired by all of you, I, too, have managed to climb out of my “Andean box’’ and have enjoyed creating some sweet patterns of my own… a collection of playful kitties (a row of which you can see at the bottom of the cover picture), leaves and flowers, sheep and snowflakes, to name a few. The patterns are arranged in themes such as Rivers and Oceans, Garden, and Andean Animals. I am very grateful to my brother and sister-in-law who not only put up with me sitting on their floor and weaving all day every day for weeks and weeks last year, but also gave me valuable feedback on my new patterns. Starting the collection of sample bands. 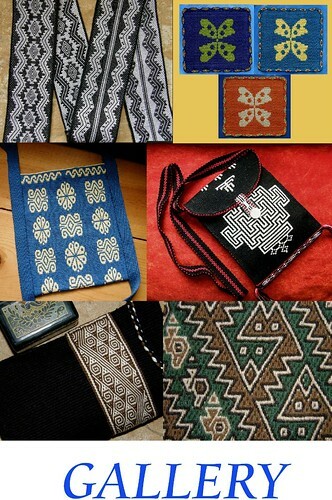 I have included a collection of patterns found on contemporary as well as pre-Columbian South American textiles and, in a few examples of these, I have given my own twist to some classic shapes used in Andean weaving. I give thanks to my weaving teachers in Bolivia who enjoy learning new patterns and using them in their projects just as much as you and I do. The motifs are charted on the same block-style charts that I use in my other books. For those of you who have used my second book, More Adventures with Warp-faced Pick-up Patterns, in which you learn to use the spotted-style charts, I have included all the patterns on that style of chart in the Appendix. I know that each charting system has its own group of fans and so I have provided both. Tutorials are included to show you how to plan the layout of your project. You will be able to adjust the charts to any width so that you can combine motifs of various sizes from different themed collections into one project. I am really looking forward to seeing how you combine the various motifs and border patterns in your weaving! And, most of all, I hope that you feel inspired to create some patterns of your own. You can find my e-book COMPLEMENTARY-WARP PATTERN BOOK at Patternfish, the home of all my pattern books and instructional manuals. 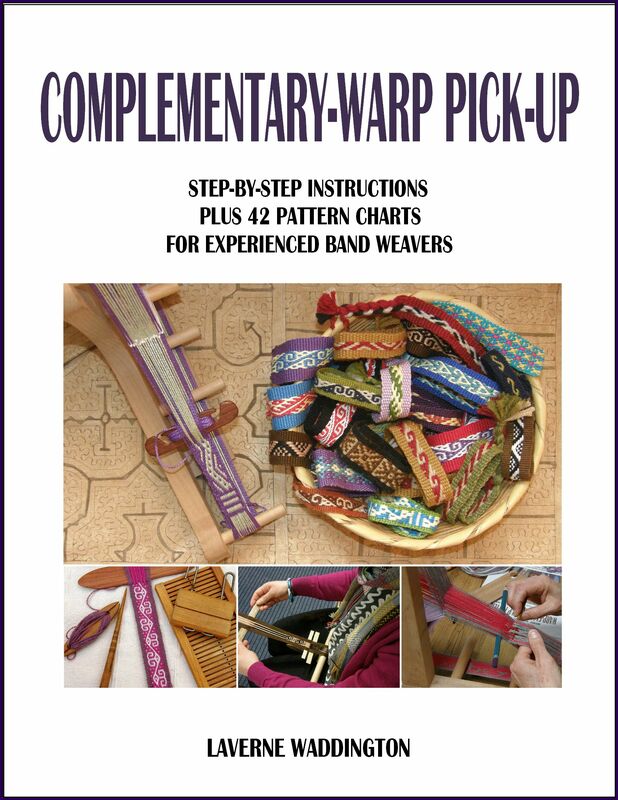 By the way, if you would like to weave these patterns but you haven’t learned the pick-up technique yet, I recommend buying my last book, Complementary-warp Pick-up, which has step-by-step instructions and forty-two pattern charts suitable for bands. You will learn all you need to know to be able to enjoy the patterns in my newest book. The patterns in this new book range in size from eight to eighty threads. Some of the wider patterns may not be suitable for inkle looms. Weavers who use inkle looms and who learned the pick-up technique in my last book, Complementary-warp Pick-up, will know that the largest pattern in that book has only twenty threads in each of the open and heddled sheds. About two-thirds of the patterns in this new pattern book have from eight to forty threads, a quarter have from forty-four to sixty threads and the rest have from sixty-four to eighty threads. Much will depend on the thread size that you like to use and the size of your inkle loom. To give you an idea, I wove a band with size 3 crochet cotton (24 wraps per inch/2.5cm) with thirty-six threads in each of my heddled and open sheds (pictured above). I feel this is the widest I can comfortably weave using my tiny Ashford Inklette . Of course, I could fit in many more warp ends and weave larger patterns if I used finer thread. The Inklette is a pretty small loom. I know that a lot of people are using the Gilmore range of Wave looms to weave pick-up patterns. Julie in the Ravelry group often shows pictures of her latest wide projects combining many patterns from my various books. She uses the Mini Wave which she tells me can accommodate up to four inches of woven width and she uses it to combine many patterns from my various books. After all the editing and proof-reading I am not sure I can look at another red-and-white block chart for a while! I close my eyes and see a blurry scroll of red and white figures! Thanks go to Sharon with all her speedy and accurate help with the charting. Fortunately, my current paisley pattern is charted in pencil on oval cells and will give my eyes a nice change. I had to leave the silk scarf project aside for some time just as I got over the halfway hump so that I could focus on putting the finishing touches on the e-book. I’ll be happy to get back down on the floor to weave again. I will certainly get a good night’s sleep tonight after a long day of preparing to launch my new Complementary-warp Pattern Book. I don’t have a whole lot to say in this post except that I have made what feels like a whole lot of progress on my scarf with its paisley-like patterns. It has been fun planning and weaving the smaller simpler motifs along the length of the scarf after all the busy-ness at the start. I am slowly adding spots and dots to the smaller motifs building up to another splash of busy pattern in the center. I love the stretches of plain weave between the motifs when I can get into that lovely shed-beat-weft-shed-beat-weft rhythm, leaning forward to relax the tension on the warp threads to lift the heddles for one shed and sitting back and strumming for the other. This warp started off as a circular one but, once I started weaving, I noticed a significant difference in tension from one side to the other which I couldn’t explain. And then I saw the cause…..urgh! The shelf to which one of my warping stakes was clamped had slid out of its bracket. I don’t usually wind circular warps and so I had needed to alter my normal set-up. This sliding must have been happening gradually as I wound the warp and I hadn’t noticed. I really didn’t feel like battling this tension difference for the entire project. That would not be fun. There would be no rhythm and a lot of fiddling and adjusting. And so I had to take some steps back before I could move forward once again. I had wound the warp in lots of small sections and so I carefully placed a section back around the warping stakes, untied the knot and wound the thread back into a ball before moving on to the next section. I had my heart in my mouth the whole time but I only had to ditch one section of blue that got hopelessly tangled. Then I set my clamps a different way to more reliable surfaces and wound an end-to-end warp. That meant that I had to roll up much of the warp around paper so that it could fit in my weaving space but I have done that before and it works just fine. I am at the half-way point repeating the large motif in the middle…. I am enjoying using the unusual shuttle that I bought at the Braids conference, unusual in that it had been soaked in an indigo dye bath. It carries the supplementary weft and is a nice size for this project. Most of the steps I have been taking while preparing this have been forward. I have around 75 patterns so far. Occasionally there is a blip where I have to take a step back to fix a chart and weave one of the designs again. Doing that is often a nice break from the 60/2 silk project. Suddenly #10 thread feels so heavy and it’s so easy to see! If all goes well and there aren’t any major steps backward, I plan to have this new book out this month. Now that Marilyn has finished weaving her own backstrap…. Rosemary wove with embroidery floss for her latest bracelets and told us how much she loved using it. She mentioned how nice and tightly it packs, how smoothly sheds open and how easy it is to see. I have never used it as warp myself. And so, it’s back to the silk weaving, the book lay-out and plying for me. It so nice to be doing rather than just planning and hopefully there won’t be too many backward steps along the way to finishing all three projects. The bands I ordered from the co-op in Cochabamba arrived. That’s always so exciting. I had been able to take a sneak peek at them when Dorinda sent me a picture of them laid out in her yard but there is nothing like seeing the true richness of the colors, smelling the natural dyestuff in the handspun wool and feeling the firmness of the cloth. I love being able to put faces to most of the names on the tags after having met many of the weavers on my visit last year. We spent a day weaving together. The tags on the bands tell of the work of Maxima, my teacher, and her sister Narciza, the go-getter, (pictured below) who chose one of the largest patterns and kept begging me to show her with ”just one more row” so that she could fully grasp it before I left. There’s young Eulalia whom I remember as being the quickest to pick up one of my woven samples and start copying the pattern. Justina’s name is there. As head of the Huancarani weaving group, she represented her weaving friends and Bolivia when she traveled to the Tinkuy in Peru last November. Antonia contributed a band too. She and her daughter wove with me at Dorinda’s place during my visit. And then there are Felicidad and Casimira as well as a new name I haven’t seen before – Cerila. Her band has a lighter touch and I wonder if she is one of the much older ladies. As for my own weaving, I drew and erased and wove and un-wove, drew and erased and wove some more. I like sampling and I almost always make something useful from the samples. That was not so much the case this time as I kind of lost the plot along the way and some of the samples are already in the trash. I told you about that in my last blog post. Sometimes I would go to bed completely dissatisfied with what I had created only to wake up the next morning to be almost completely happy with it. I decided that I needed some feedback and so I put a picture on Instagram. The response was favorable and very supportive and confirmed that I was headed in the right direction…thank you, guys… and so I felt that I was at the point where I could tackle the ”real” project and put the sampling aside. This is warp-faced double weave in 60/2 silk. My paisley-like shapes don’t have the curled tails that you often see in classic Paisley shapes. That is a further challenge that I will leave for another time! The parts of the pattern in my sample that have long horizontal stretches of solid white won’t work if they are woven using supplemental weft. They will result in exceedingly long weft-floats. Floats of that length are impractical. They can easily get caught on things and pulled. I needed to break up the long white solid sections into smaller ones. For example, look at the solid white paisley shape that sits within the larger one at the bottom left of the design on my sample. I would need to fill that shape with circles and spots to break up the long horizontal lines of white into shorter floats. So, here is the scarf warp underway. The start and end of the scarf will have its busy pattern and I will keep things much simpler along its length. I might double the large design for the center of the scarf or I might even repeat it at every quarter. We’ll see how it goes. I used multiple strands of 120/2 silk in three different colors for the supplementary weft….a deep red and two tones of purple. What’s fun is that the colors of the pattern look quite different depending on how the light hits the cloth. Now I think I will pick up my drop spindle and finish plying the wool I spun for the Tour de Fleece many years ago. It has just been sitting there and I would like to use it to weave just one more cuff for our Bracelets and Cuff Weave-along on Ravelry. I might be able to squeeze this in before the end of the month. This is yarn I spun from a bag of random fiber that I won in a little Ashford online competition and I think the colors might go well enough together for a cuff project. The blue, red and white are wool. Both the red and blue are variegated but you can hardly tell. The red fiber was a weird red and brown combination that I didn’t like at all. But the spun thread looks quite nice. The cuff in the picture is one I wove from my handspun llama fiber a few years ago. It’s one of my favorites. I used spearmint leaves and cochineal (for the beige and red) as dye. I want to weave something similar with this new batch of handspun and add a tubular edging. Here’s a nice collage of some of the weave-along bands. I am really happy to see how people are using the patterns and technique from my latest book on complementary-warp pick-up. One thing that KEOG discovered when she added a safety chain to her bracelet is that if the clasp is magnetic it is better to find a chain that won’t be attracted to it. That hadn’t even occurred to me. If you are considering this kind of closure for a bracelet, you should keep that in mind. I have a couple of cheap clasps that came with chains and it just so happens that they are not attracted to magnets. This is Julie B’s work using a complementary-warp pattern from my second book, the one I like to call the Rolling River. I love seeing how people use various kinds of looms to enjoy these techniques and patterns. I will finish this post here with a celebration of Taproot Video’s one-year anniversary. I am one of the founding-year members of the cooperative and we celebrated the anniversary via email recently. I won’t be seeing the other members until April when we’ll be able to clink mugs and celebrate again. What is even more meaningful to me personally, is that Taproot’s launch also marked the release of my first ever instructional video. It was a scary trip at first, but it has been fun and heart-warming seeing my dvd make its way to countries all over the world and receiving such favorable feedback. The video can be purchased as a dvd or you can buy lifetime streaming. People very often ask me if it is hard to learn backstrap weaving on one’s own. Most often this question is more about the weaving techniques rather than about the loom itself. The kind of weaving I do on my backstrap loom can be done on many other kinds of looms and I have written tutorials and books about these techniques and plan to keep adding to those with more books, photo tutorials and dvds. My new pattern book is coming along nicely. What about learning to use the loom? That is a little trickier because the weaver’s body movements are so much a part of the smooth operation of the loom and that can sometimes be hard to understand on your own. It is a lot about ”feel” and that is something that I wanted to be be able to convey via my video class. Many people have told me that they feel that I am in the room with them as they watch the video class. That is exactly what I was hoping to achieve! Even those who were already up and running and using a backstrap loom speak of having had several ”aha” moments while watching. It has been a great first year with Taproot and I would like to thank everyone who has bought the video so far. There will be more video classes coming. See you next time with, hopefully, a whole lot more to tell about the paisley progress. My contribution to the Cuff and Bracelet WAL. February is here and we are still weaving along in the Cuff and Bracelet Weave-along on Ravelry. I had initially proposed closing it at the end of January but I think that folks are just getting warmed up! I have to hang my head in guilt as, since finishing the first cuff, I have allowed myself to be completely captivated by my paisley project. Yes, I am still sampling paisley shapes! I took my own advice from my tutorial on Designing for Double Weave in which I say that once you have traced your pattern onto the charting paper, you should put the original drawing away because you will never be able to exactly replicate it and you will, therefore, always be comparing and feeling that the shape you have charted is not good enough. The problem is that I changed my traced shape and re-drew and reshaped and changed it again and again to the point where I had completely altered it. It no longer looked like the classic paisley shape and looked like more like a large comma….a large circle with a tail. I had to get the original drawing out to remind myself of the original idea and start all over. Now I am working on all the little spots and dots that fill in the spaces within and around the paisley shapes and am finding that there is a very fine line between a well-balanced layout and total chaos! I learned the value of a good pencil and eraser….love my palomino Blackwing 602…thanks, Lori for putting me onto those. Here’s the latest sample warp. I seem to be in a blue phase…such a nice cooling color in this summer heat. The heddles are made with tatting thread which is a similar girth to the 60/2 silk. They work pretty well together. I am using four heddles simply because my warp thread is so fine and because there are so many ends…360 in the pattern area. Normally when I do double weave, I keep it simple and reduce the clutter by just operating with two sheds. On narrow bands I work much faster that way with just two basic sheds. Participants in the Ravelry Weave-along have been producing some gorgeous things. KEOG’S bracelet is so elegant with its magnet closure. She said that she was not sure about how well the magnet would hold and I agree that the bracelet could well snag on something which might pull the two magnets apart. I think that she could add a fine safety chain to the loops on the ribbon clamps so that the bracelet could be opened wide enough to slip over her hand. Then she could close it with the magnet. I imagine that the dangling safety chain would look elegant too. Here is Katherine’s first weave-along band cut into two for two potential bracelets. They came out a little too wide for her hardware and so we will see if she comes up with another idea for transforming these bands into bracelets. She used the Andean Pebble Weave structure to create her patterns. I love the way Jan posed her cuff for this picture. She wove a pattern in a supplementary-warp structure. She used a technique for the closure which is used by the Mayoruna people of Peru as described in this issue of The Weaver’s Journal. Aphelocairos is weaving the above piece on her inkle loom using a pattern and instructions from my Complementary-warp Pick-up book and has joined the weave-along so that she can make a bracelets with her bands. Any loom that allows you to create warp-faced fabric can be used for this pick-up technique which requires just two basic sheds. I might use this now as an excuse in this New Year to remind you of my latest e-book which is available from Patternfish.com….A an edition in German is under construction. It is aimed at ”experienced” band weavers by which I mean that you need to know how to warp and set up your loom of choice and weave warp-faced plain-weave bands. It’s as simple as that! Below, you can see Rosemary’s band. She is working from my book too and is using a combination of linen and cotton. She’s working on a backstrap loom, has wound a long warp, and hopes to get several bracelets from it. Janet has been learning complementary-warp pick-up from my book. She is not actually participating in the weave-along but perhaps she will decide to make this band into a bracelet or two when she is done. I love this pattern which is included in the book. My weaving teachers here in Bolivia always weave it in black and white, as have I. It is great to see it in other colors. Janet is using a Gilmore Wave loom and her second band, using another pattern from my book, is even more striking than the first…. My inbox also brought news from Dorinda. She lives up in the highlands of Cochabamba and works with Maxima and the other weavers in the co-operative that she helped establish. Firstly, she told me that she had mailed my latest order of long bands that the ladies make with their handspun naturally dyed wool. I always order a mix of bands…half with cochineal red and half without…. Then she showed me a picture of what Maxima has been weaving using my second book. I left a copy of the book with the ladies when I visited last year. Maxima can weave the patterns by simply looking at the photos of my samples. Other ladies in the co-op say that they read the charts. Each person has their own way of seeing things. The problem for Maxima is that not every single pattern has a pictured woven sample. Here is a band which Max wove working from the pictures in my book. This puts a big smile on my face! Dionicia, who is the oldest member of the co-op at 86 years of age, looked at one of Max’s other sample bands when she was in town. It was another band that Max had woven using patterns from my book. Dionicia then went back to her community and wove the pattern from memory. An NGO in town has given synthetic yarn to the ladies and encouraged them to weave tapa bancas (bench seat covers) to be sold at the local market. Dionicia has made her first one and included the pattern she had glimpsed on Max’s band. Yes, each person has their own way of learning new patterns! And here is one of his latest projects. I love seeing other people’s set-ups. I see a nice coil rod in place there. Winding wide warps with perfectly even tension is always a challenge. I have my way which involves warping in sections. I don’t allow the threads to climb up too high on the warping stakes so that I don’t risk having the stakes lean in. Carlos is experimenting with different ways and is interested in a set-up that he has seen in videos on warping in Mexico, a system which is also used in some communities in Guatemala. My teachers in Guatemala used a system of spaced vertical stakes. He showed a screen shot of the warping board and is interested in building one of his own…. And here I will leave you to make some more progress on my spots and dots and swirling paisleys….hoping not to fall over the edge into chaos! I am back in Bolivia and as much as I wish I could throw all the lovely silk I bought at the ANWG conference in Canada earlier this year onto my backstrap loom and weave something large and lovely, I realize that I am simply not in the best state to do so. Why?… Jet lag. I’ll say it again….there is something about flying from west to east through all those time zones that makes the jet lag particularly brutal. I have been at home six days now and still struggle to stay awake long enough to be able to finish a meal! So, I decided it would be wise to start with something small. Better still, I decided to finish off some projects rather than start something new. Those are all natural dye colors. I hope that everyone who bought pieces will enjoy hanging them on their walls or maybe cutting them up to make bags or pouches. Don’t feel bad about cutting them up. That is exactly what the weavers themselves in the co-op do with these pieces. I know that Julia is thinking about using one of her pieces to sew a case for a charka that she is having built. Julia sews beautifully and constructs gorgeous bags. I have shown the bags and other items that she has made with her backstrap woven cloth on this blog many times and I can’t wait to see what she constructs with this cloth. My own projects with this cloth tend to be a lot more basic. My sewing skills are very limited. I like to make small pouches similar to the ch’uspas that the ladies use to carry their coca leaves. This is one of the bands that I had bought from Dorinda to use when I teach tubular bands and sewn embellishments to my weaving friends. I cut it into pieces so that each of my friends could have a piece with which to practice and perhaps later turn into something useful, like a pouch. While holding the beautiful cloth in my hands and breathing in that special aroma of the highlands it is hard to imagine the amount of work that went into its creation. For a long long time I have been demonstrating decorative stitching on a piece that I had cut from the long band pictured way above. I have created the stitches and then cut them out, created them again and cut them out again as I demonstrated the method over and over to my weaving friends. I decided that it was time to ”retire” this particular piece of cloth, that is, make it into something more than a demonstration piece and allow it to sit in peace on the table as a sample when I am not using it. So, I sewed it into a pouch and decorated it with stitches and bands that are typically used by weavers in Bolivia. I like using Cascade 220 yarn and KnitPicks Palette as they have colors that very closely resemble the natural dye colors of the Bolivian highlands. Here’s the finished pouch. I used ”coil stitches” along the bottom, wove and sewed a tubular band along the sides, decorated the top edges with cross-knit looping and wove a pebble weave band for the strap. It is just the right size for carrying my small purse when I travel. Here’s a closer look at the tubular band with its ñawi pattern and the cross-knit looping. I wove the tubular band and the strap with KnitPicks Palette yarn. It is much finer than the Cascade yarn and the handspun that was used for the pouch itself and makes a a very neat tubular edging. See how perfectly the colors match? I used the Cascade yarn for the coil stitches and the cross knit looping . And here’s a closer look at the coil stitches. I love those chunky coils! With that project under my belt, I turned to something else that I could finish off. I really won’t trust myself to the critical task of warping with my 60/2 silk until I feel that my feet are completely back on the ground again…and they are not quite there yet! However, I did find something silky to get into. It must be a couple of years ago now that I was offered a whole bunch of tiny naturally dyed skeins of silk from a guild member’s estate by friends in Grass Valley. When you are a backstrap weaver, amounts like these are not too small! What fun I had rolling the skeins into balls while thinking of ways to combine the colors. There was cochineal, logwood, madder, indigo…. I didn’t want to risk wasting any of it and so I chose some colors and first wove a small sample as a width gauge. That sample has since become a wrist cuff. After that, I was free to plan some bigger things combining the reds and berry colors, then the purples and golds, the browns and tans and finally the greens and sandy colors. And, the pieces have sat since then waiting to become something. I had the idea to use them to cover notebooks or journals but what were the chances of finding books of exactly the right dimensions to fit all four pieces? Well, as luck would have it, I know a gentleman who makes books and who has a whole studio devoted to it in his home. On my first visit to his studio, I hadn’t taken the pieces of fabric but was thrilled when he offered me off-cuts of beautiful pieces of decorated paper that I could use inside the covers of the books. I had to try and imagine which bits of paper would best suit my woven pieces. A year later, I visited him again and remembered to bring the fabric. He agreed to cut some books specially for my project. By scratching around in the stores here in Bolivia, I had found two suitable books and the project was at a standstill until could find two more. Each of the four pieces of cloth is a different width as I had just thrown together random amounts of the various colors until I liked what I saw. So, there are my two beautiful custom-made notebooks for my project! We chose paper with a grid of squares so that I could use the books for charting. I intend to fill them! Then came the time to match the paper with the weavings, something which I hadn’t yet bothered to do. Without all four books ready to go, I had had no interest in the project. I am really pleased with the way the paper and cloth look together. I think I just got lucky and managed to choose well. Then it was time to get out the glue and construct. I use contact cement. It works well with the fabric and does not penetrate and stain it. It is tricky stuff however, as once those two glued surfaces make contact there is very very little wiggle room for adjustment. I turn the edge of the fabric to the inside of the cover and glue it in place. It looks pretty rough at this point. Once it is holding there nicely, I apply glue bit by bit to the front cover, the spine, the back cover, and then finally turn the edge to the inside of the back cover. I don’t let the glue completely dry. While it is still wet, and there is still room to maneuver, I wrap the cloth all the way round the book and then open and close the covers to make sure that I have stretched the fabric just the right amount. Then I peel it back, wait for the glue to dry and make the final contact…that’s the point of no return! What’s next before I launch into the big project? I am trying to think of what best to do with the piece of cloth I wove for Marilyn. You might remember this piece in pink and purple I called ”sunrise, sunset” which I wove using Marilyn’s 10/2 perle cotton. All I am seeing right now is a tool bag but I don’t have the right colors of yarn to decorate it to my liking. Perhaps I should just give the fabric to Marilyn and see what she would like to do with it. Or maybe tomorrow I will wake up with a whole new idea. I’ll let it rest for now. Oh, and the other thing I have been doing since I got home is charting…lots and lots of charting… for my next book of complementary-warp/pebble weave patterns. I am drawing out the spotted charts and then my friend Sharon will draw up the block charts for me. So, yes, I have been pretty busy and quite productive since I got back. And, I upgraded my internet. It pays to keep checking with the providers every now and then (which I have neglected to do) as prices drop and I find that I can now afford the faster and more reliable service. No more having the signal cut off every 40 seconds which means I can even use Skype now…yippee! And I have an unlimited Megabyte allowance. I celebrated by listening to the WeaveZine podcasts, Weavecast, that I have never been able to listen to before. Seeing as the second volume of Rodrick Owens’ book on Peruvian sling braids has just come out, I decided to listen to his podcast first. These podcasts are wonderful things that Syne Mitchell has created for us along with all the marvelous WeaveZine articles that she published. Another thing I have been able to enjoy with my new internet service, without stops and splutters and various other interruptions, is a new free video on Sprang Braiding that expert Carol James has made available on Taproot Video. In this free video she teaches the basic technique using a method that does not require any kind of loom or frame. It’s awesome! Julie has been showing pictures of bands she has been making using her MiniWave loom. She is well and truly hooked on the complementary-warp pick-up technique and, after studying the ”picking cross” method in my latest book and weaving some of the patterns there, she is now gobbling up the larger and more complex projects in my second book…. This particular pattern is very dear to me. It was the pattern on the very first piece of weaving I bought on my first trip to Peru. It was a mere scrap I found in a street market and all I felt I could afford at the time and I bought it before I had found my first weaving teachers. I puzzled over the pattern for quite some time trying to replicate it before I realized that weavers quite often combine more than one kind of arrangement of floats in a single piece. Julie’s piece is beautiful. Now she is weaving another great favorite of mine that I like to call the ”Rolling River”. I love this picture with Julie’s two swords nicely holding the picking cross and her pretty pick-up stick, all made by Terri at Magical Moons. I am hoping to get the big silk project going soon and I think I will be able to show it to you in the next blog post. I’ll be announcing the ”Cuffs and Bracelets” Weave-along on Ravelry soon. I am hoping to get it started in the first week of January once all the festivities are well and truly over. The idea is to weave several short and narrow projects in plain weave or pick-up that can be made into bracelets by applying ribbon clamps and other jewelry findings. I’ll write more about that in the next blog post. Christmas will be happening in the meantime. I hope you all have a happy one. The Virgin Mary/Pachamama taking the form of Cerro Rico, the mountain of silver, in a painting from colonial Potosi. Pachamama is a goddess revered by the indigenous people of the Andes. She is also known as the earth/time mother. In Inca mythology, Pachamama is a fertility goddess who presides over planting and harvesting, embodies the mountains, and causes earthquakes. She is also an ever-present and independent deity who has her own self-sufficient and creative power to sustain life on this earth. Her shrines are hallowed rocks, or the boles of legendary trees, and her artists envision her as an adult female bearing harvests of potatoes and coca leaves. The four cosmological Quechua principles – Water, Earth, Sun, and Moon – claim Pachamama as their prime origin, and priests sacrifice llamas, cuy (guinea pigs), and elaborate miniature burned garments to her. After the conquest by Spain, which forced conversion to Roman Catholicism, the figure of the Virgin Mary became united with that of the Pachamama for many of the indigenous people. In pre-Hispanic culture, Pachamama is often a cruel goddess eager to collect her sacrifices. As Andes cultures form modern nations, Pachamama remains benevolent, giving, and a local name for Mother Nature. This trip away (which began for me way back in the last weeks of September! ), has had its share of acts of Mother Nature. First, a cluster of hurricane activity threatened, but fortunately did not hinder, my flight into the USA. Then, I arrived in a devastated Santa Rosa, California just a week after fires fed by raging winds had destroyed hundreds of homes and taken lives. I saw the devastation. Solidified pools of molten metal on sidewalks were a shocking revelation of the incredible heat that the fires had generated. All so terribly sad. And now other weaving friends in southern California are on standby as fires rage in Ventura county. On this side of the world (currently Australia), Mother Nature made her presence felt in the form of an erupting Mount Agung in Bali. And, this time my plans were indeed disrupted! I was five hours into my flight to Bali. We had already left the Australian coast behind when the Captain made an announcement. I fully expected him to tell us that we would be starting our descent in 20 minutes. Instead, he told us that after months of threatening rumblings, Mt Agung had finally erupted and that our flight had to be diverted to Darwin because of the threat of ash clouds in the vicinity of the airport in Bali. Reports said that tens of thousands of people from surrounding Balinese villages and settlements had already been evacuated back in September when the volcano first began to show signs of high activity. It was a waiting game and I decided to take a chance. For me it is a blip, a slight detour, in my plans. Here I sit safe and comfortable in Sydney while a reported 30,000 people’s lives in Bali have been dramatically changed. So close! A picture from the inflight flight tracker…. I must give a shout out to Jetstar Airways who were amazing. They kept us safe, got us all home and gave us credit vouchers for our flights… for something that wasn’t even their fault. Well….back in Sydney, I decided to make the most of my time. I wove and wove during the time that I was meant to be in Bali! I got to work on my next book of pick-up patterns and I am pleased to say that I have 95% of the patterns woven and ready to be photographed. Then, I will start working on tidying up the charts. Many of the patterns I had in mind are way outside the ”Andean Box” and required a lot of weaving, un-weaving, chart adjustment and re-weaving. After over twenty years of weaving these intriguing structures, I am pleased to say that I am still learning! I have been granted the use of many wonderful contributions from weaving friends around the world…motifs and shapes that I never thought would be possible to carry off in this structure. My weaving friends out there are awesome! So, it has been an interesting exercise in discovering the possibilities as well as the limitations of this particular structure. And, it has been interesting, challenging and very rewarding being able to find work-arounds for some of the limitations. I have a lot of my weaving kit with me and it was just a matter of getting some yarn and finding a place to anchor my warp. Some railings in my brother’s home and a nice cushy bit of rug gave me the perfect spot in which to work. I have set up this warp for Andean Pebble Weave with its two additional sets of heddles. Setting up the warp this way is slower but it makes weaving these particular patterns faster as only every other shed needs to be picked up by hand. Of course, you don’t have to use the two sets of heddles. You could just set up the warp with its two basic sheds…one dark and one light as seen above… and pick up every row by hand. People who work on fixed tension looms, like inkle looms, Wave looms etc might find this method more comfortable. This is the method I teach in my latest book Complementary-warp Pick-up. 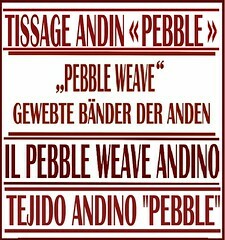 With this method, you can weave any of the various complementary-warp structures which include Andean Pebble Weave. One thing that was missing from my kit was a small shuttle and I was glad for ice cream sticks that I had been collecting and throwing into my tool bag as they made sweet shuttles for these projects. I am not a fan of the combined beater/shuttle tools. They just don’t suit my rhythm. So, I always have a sword/beater and a separate shuttle. You can see one of the lovely Magical Moons maple swords in my picture above and some of the little shuttles I use below. I like having a nice collection of shuttles of all sizes. The ones pictured above were made for me by my weaving friend Jim Smith. South American indigenous weavers use simple sticks around which they wrap their weft thread. If you need a new shuttle for a particularly wide piece of weaving, you can just go out and find one on the ground or on a tree! I am not fond of using those kinds of shuttles even though I see how practical it is to be able to just step outside and pick one up from the garden and cut it to the exact size you need. Here’s a short video of two weavers loading their simple stick shuttles. The first lady is one of my Montagnard Vietnamese teachers and the other is from the Cusco area of Peru. If the band I am weaving is particularly narrow, I don’t use a shuttle at all and prefer to work with weft lengths of a yard or so. I love just being able to whip the weft back and forth. My cat always found that very amusing! Plus, it makes un-weaving super easy! As for joining in new weft, the joins don’t show when I am weaving a warp-float structure which means that working with short lengths is not a problem. However, the joins do show when I am doing plain weave. So, I avoid running out of weft for plain weave and will load up a shuttle with a good amount of weft for that. Here’s a video, just for fun, to show how I work with short weft lengths on a tiny warp. It also shows the speed of using multiple heddles…in this case I think there are seven. This is not the way I prefer to weave. In this video, I was pumping out one of several promised products and just wanted to weave fast! I am usually less concerned with product and more in love with the process and I enjoy having my hands in among the threads picking up the patterns. In the video, the two light green heddles closest to me hold the pebble sheds. These are alternated with the other heddles that hold the pattern picks. I never put down my sword when weaving narrow bands and even do simple pick-up while holding onto it. Back to my ”get-over-Bali” weaving therapy: next came a Christmas-themed band. This was fun as I got to weave patterns that I had only charted but never woven. There was a bit of un-weaving and some adjustments to be made. In the meantime, I have been receiving mail from friends who attended the Tinkuy in Cusco last month. I was most curious to know how my teachers and weaving friends Maxima and Justina had enjoyed the event. It was Max’s third time and Justina’s first. Dorinda, who accompanied the ladies and who was responsible for raising the funds to make the trip possible, has written a blog post about it. Here are Max and Justina on Day One getting ready to join the pre-conference parade through the streets of Cusco. Photo by Karen Sprenger The ladies delivered a Power Point presentation on weaving traditions of their Central Bolivian communities. I had been hoping that Max and Justina would present early on so that they could then relax and enjoy the rest of the conference but, no, it turned out that they were the very last pair to present just before the closing ceremony! I hope that they were able to put their nerves away during those first days. Photo by Cat Bordhi. Max and Justina, sold products from their weaving co-op, participated in demonstrations and spinning competitions and took part, as students, in some of the workshops. Pictures courtesy of PAZA Bolivia. Visiting with Maxima last January sitting alongside one of my completed band orders. But, HURRY! Dorinda can only accept orders until December 14! Order through the PAZA site. Pictures have been arriving from people with whom I have woven on my trips away as well as from people I have never met. I love getting this kind of feedback from people who have been using my books and free tutorials on this blog. Thank you! Caroline, who recently wove double weave with me with friends in Arizona, finished one of the bands she had started with a cute llama motif and attractive twisted fringe. Thanks go to Karen in Cincinnati who adapted the llama motif to a narrow band from one of my much wider pieces. Claire in Tasmania, with whom I wove in August, used one of the patterns from my latest book to weave this elegant band in linen and cottolin. She commented that after a good hard press, the linen looked and felt beautiful. I haven’t yet worked with linen and I love the look of this band. I am excited that I will be able to return to Tasmania to weave with Claire again next year. Bob Seymour followed my double weave tutorial on this blog and designed his own Kokopelli motif. Fabulous! Below, you can see work from Julie using her Mini Wave loom and using the technique I teach in my book on Complementary-warp Pick-up. The first pattern is from that book and Julie is using the method to weave the second larger pattern which is in my second book. One of the members of the Ravelry group told me that she learned to weave patterns by picking up all the sheds by hand from my latest book and likes that method so much that she is using it now even for the patterns for which she could use additional heddles. Once people learn how to do complementary-warp pick-up and see how simple it is….just hands and sticks and no extra heddles….they quite often do not feel the need to add the optional extra heddles for the Andean Pebble Weave technique. Jörg has combined two 12-thread patterns from my latest book. I love the combination of colors! Karen Sprenger showed me how she has been progressing with the double weave bands we started together. You can just see a bit of the Tinkipaya-inspired motif and the marvelous system of pegs and cords that I am pulling to lift the threads for the pattern. Vatinee in Thailand is currently into Andean Pebble Weave patterns as well…great colors! And, here’s Wendy’s finished band in Andean Pebble Weave…we have pebble weave in luscious pinks and blues on looms in different parts of the world! What fun. As for me, I am about to weave some cats! And yes, I do love those two sets of heddles for the pebble sheds! The collection of new sample bands is expanding! Heading back to Bolivia soon to throw this silk on the loom!